L'essai le plus original paru sur Lautréamont depuis longtemps. Since the 1874 publication in Belgium of the first posthumous edition of Les Chants de Maldoror, the enigmatic work has served as an inspiration for the poetic and creative liberation of countless twentieth-century writers and artists. Little is known, however, about the book’s elusive French author Isidore Ducasse, known as le comte de Lautréamont, and his abbreviated life (1846-1870). In the absence of an original manuscript, Lautréamont’s readers have over time altered his poetry for personal, political, and aesthetic reasons. Symbolist literary journals, first editions of his work, surrealist illustrated editions, and the prestigious Pléiade edition (1970 and 2009), reveal how varying editions of Lautréamont’s work have in turn contributed to his legend. 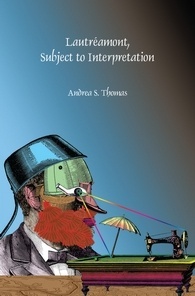 In Lautréamont, Subject to Interpretation, Andrea S. Thomas carefully explores these editions of this so-called poète maudit to show how impassioned readers can shape not only the reception of works, but the works themselves.